PBN Hill+Knowlton Strategies’ co-founders and top executives Peter Necarsulmer and Susan Thurman today announced the appointment of Myron Wasylyk as chief executive officer of the strategic communications company, effective Jan. 1, 2014. Wasylyk, 51, will lead PBN H+K’s operations in Russia, Ukraine, Kazakhstan and the United States from its Moscow headquarters. A partner and shareholder in the firm, Wasylyk established and then directed the company’s successful Ukraine office since 1996, where he was also responsible for clients and operations in Azerbaijan, Moldova, and other CIS countries. rs alongside majority shareholder WPP PLC. 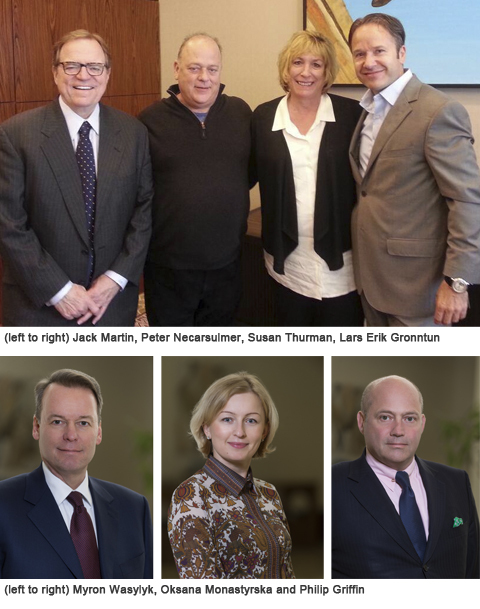 “The appointments of Myron Wasylyk as CEO, and the new roles for Necarsulmer and Thurman, mark an important management transition in the firm after more than three decades in business, which included start-up strategic communications businesses in Russia, Ukraine, Kazakhstan and other CIS countries,” said Hill+Knowlton Strategies Global Chairman and CEO Jack Martin. “PBN has pioneered and defined the public relations and public affairs industries in these countries since 1991, and this move will allow PBN Hill+Knowlton Strategies to continue shaping the market going forward,” Martin added. The Holmes Report ranked PBN H+K Strategies 2013 Russia Consultancy of the Year. Some of its blue clip clients include Abbott, Amazon, Bank of America Merrill Lynch, Chrysler/Fiat, Etihad, Evraz, Kingfisher, Kinross Gold, P&G, Platts, Russian Copper Company, TripAdvisor and Yota Devices. “Promotion from within PBN Hill+Knowlton Strategies will ensure that our trademark high level client service and strategic counsel will continue going forward,” said Peter Necarsulmer. “No one is more qualified to lead the firm in this period of growth and expansion than Myron Wasylyk, our partner of 17 years,” he added. “With Myron as CEO of PBN Hill+Knowlton Strategies, we have a seasoned strategic communications expert and a proven leader,” said Lars Erik Gronntun, president of Hill+Knowlton Strategies Europe. “I have come to know Myron for his sound judgment and visionary ideas, and I fully endorse Peter and Susan’s choice of successor,” Gronntun added. Oksana Monastyrska, a 16-year veteran of the company who runs the firm’s corporate, crisis, and marketing communications practices in Ukraine, was named vice president and managing director of the Ukraine operations effective Jan. 1, 2014. Senior Counselor Philip Griffin was appointed director of government relations in Ukraine, also effective Jan. 1. Hill+Knowlton Strategies, Inc. is a leading international communications consultancy, providing services to local, multinational and global clients. Nearly half of all Fortune 500 global companies have chosen to work with Hill+Knowlton Strategies. The agency, headquartered in New York, is part of WPP, the world’s largest communications services group. For more information, please visit www.hkstrategies.com.